See below for details of Interior and Exterior Features. Following the redundancy of the church, many of the items listed here have now been transferred to other churches. 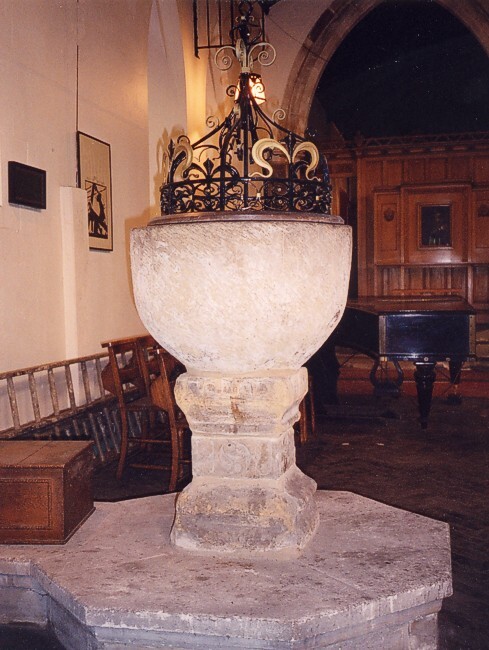 The font was moved into the church from the iron chapel previously on the site. It is medieval, originally coming from St Helen’s Church, South Wheatley (North Notts) which was demolished in 1883. The cup bowl is of rough stone with a thick lead lining. It is supported by a square pedestal thought to be of a later age. The central faces of the support column are decorated with a small quatrefoil. Other decoration appears to have been applied but it is no longer discernable. The present location of the font is the north aisle. In Dear Old St Catharine’s, a booklet written in 1929 by the then Vicar, it is clearly shown sited in the south-east corner of the church. This drawing also shows two steps at the base of the font; at present only a single step is evident. 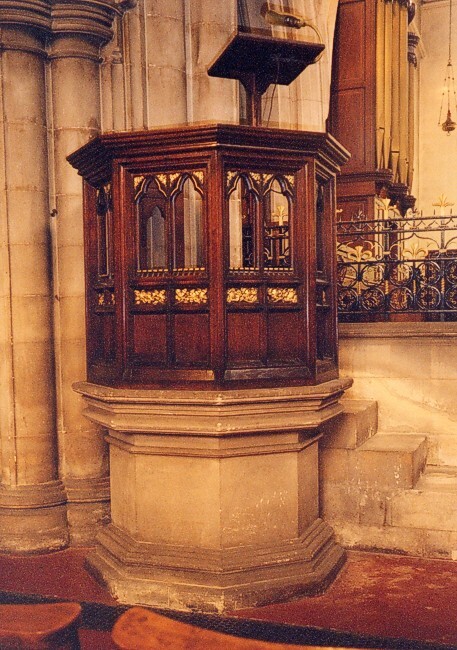 The font cover of ornate iron work over a wooden lid is formed in the shape of a crown, and was given in memory of the first vicar. 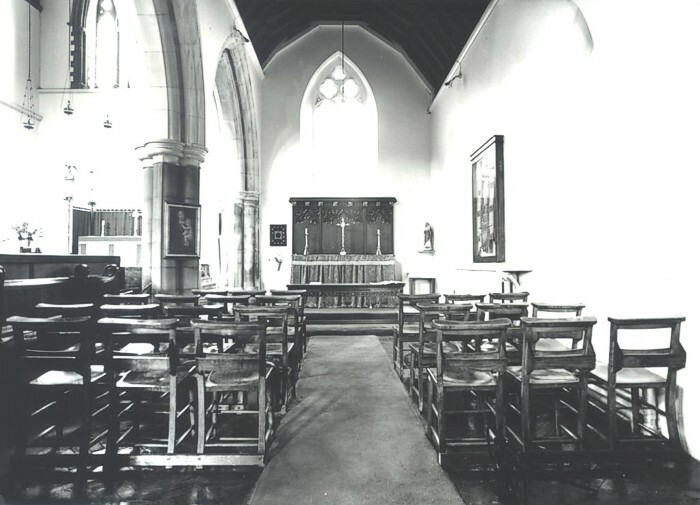 Seating for the congregation appears to have been the rows of stained beech-wood chairs still in use today. On the left of the chancel entrance is an ornate pulpit, raised on an octagonal stone base. Accessed by a short set of stone steps leading in front of the chancel wall, the upper part of the pulpit is formed from octagonal oak panels. Each section has two plain stained panels at the bottom, surmounted by narrow two carved panels decorated with gold, over which there are two arched open panels with gilded carved spandrels. 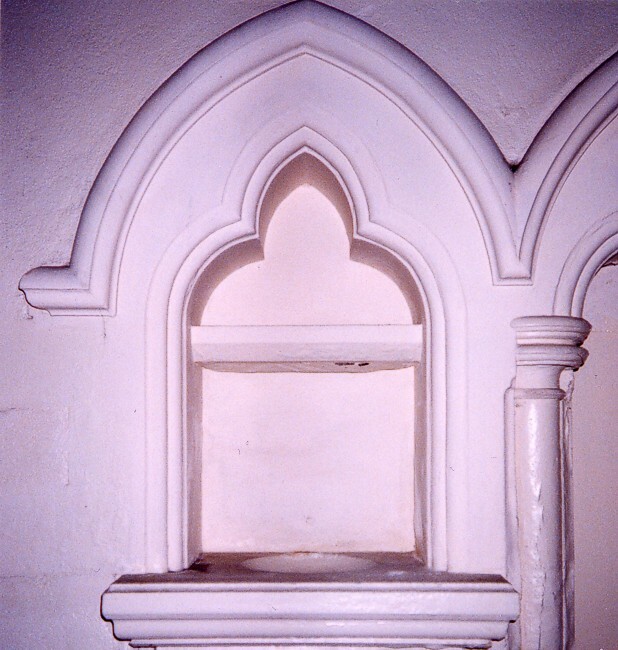 The top of the pulpit is capped with a double ogee moulding. 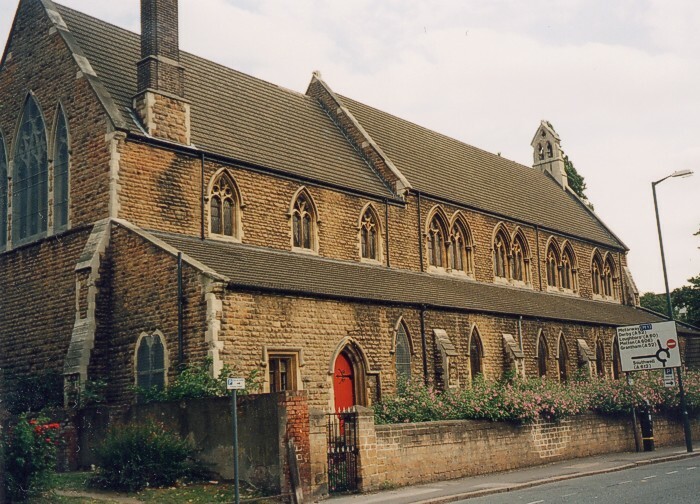 It was given to the church by the architect Mr Robert Clark. The carving is the work of Mrs Gertrude Wadsworth. 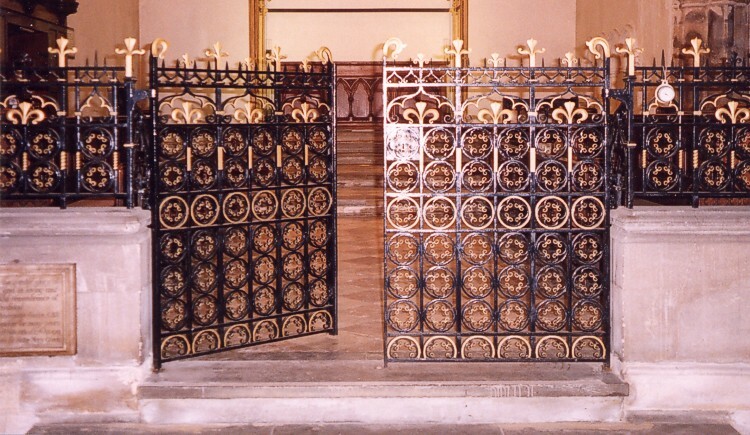 Separating the chancel from the nave is a pair of heavy ornate wrought iron gates, flanked on each side by a low stone wall topped with wrought iron of the same design. The ironwork is in excellent condition, painted black with gold decoration. This original feature of the church was made by the village blacksmith of Brant Broughton, Nr Grantham Lincolnshire. 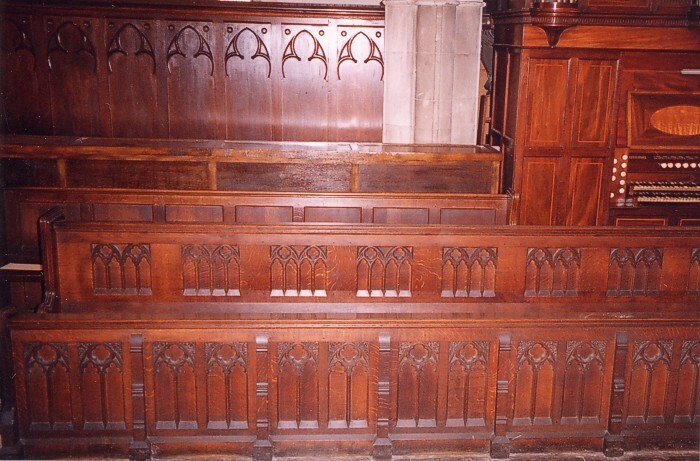 The two rows of oak choir stalls on each side of the chancel have carved panelled fronts. The front stalls are more elaborate than the rear. On the left hand side, at the rear adjacent to the organ, there is an additional short stall of a much plainer panelled style. 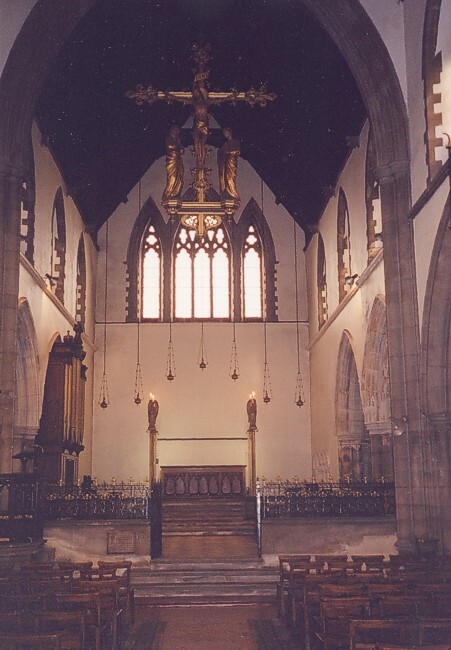 This was installed after the fire of 1946, and fills the space created when the replacement organ was moved into the next archway of the chancel. The high altar is made of oak in the English style with arcaded front. It is raised on three extended steps, and is within a traditional setting of four gold coloured riddell posts. The two at the front are surmounted with angels and support electric light fittings. The riddell posts were installed in 1921 funded by part of a legacy from John Basil Pearce who was killed in 1918. Three sedilia are set into the south wall of the chancel. Each is flanked by, and separated by a plain stone shaft and surmounted by a trefoiled arch. The seats are made from stone as are the other parts of the sedillia. Several layers of paint have been applied over the years covering the original plain stone finish. The photograph illustrates the present poor condition of this area of the church. The piscina is set on the left hand side of the sedilia. It has a shallow round bowl with a central drain. Likewise it is set under a trefoiled arch, but it has no shafts enclosing it. 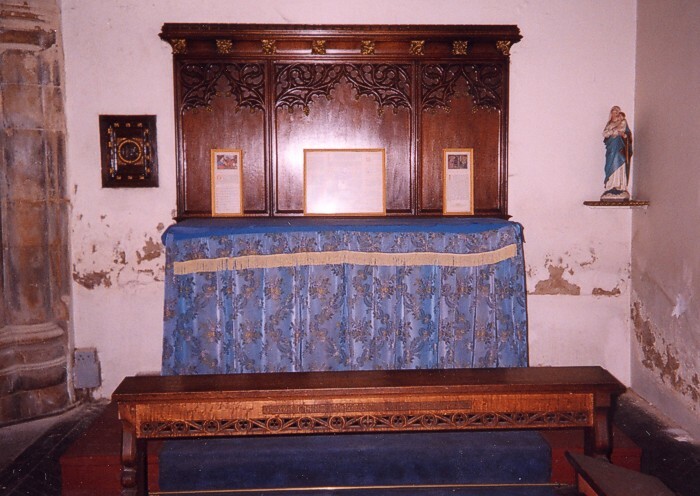 The Lady Chapel altar is covered in a heavy blue cloth, which when lifted reveals an eighteen-century oak communion table of very high quality. 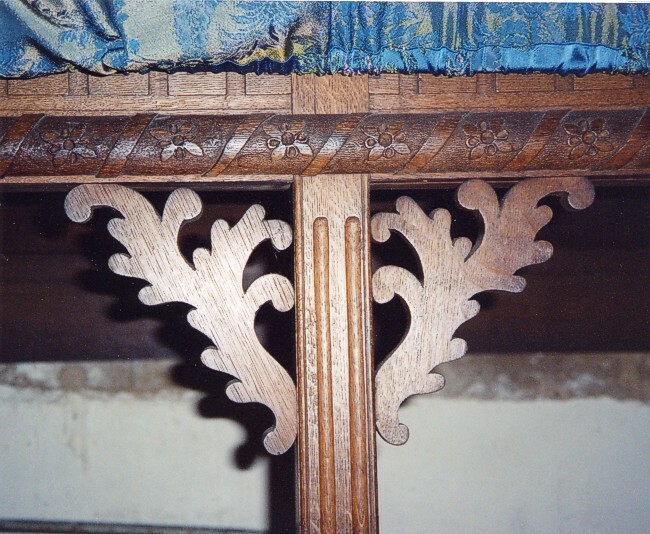 It has four square fluted front legs, connected by geometric carved top rails finished with a continuous rope carved facing and fret brackets. It is recorded as being used in the old iron church after being given by the Rev W.Langley of Narborough, Leicestershire. 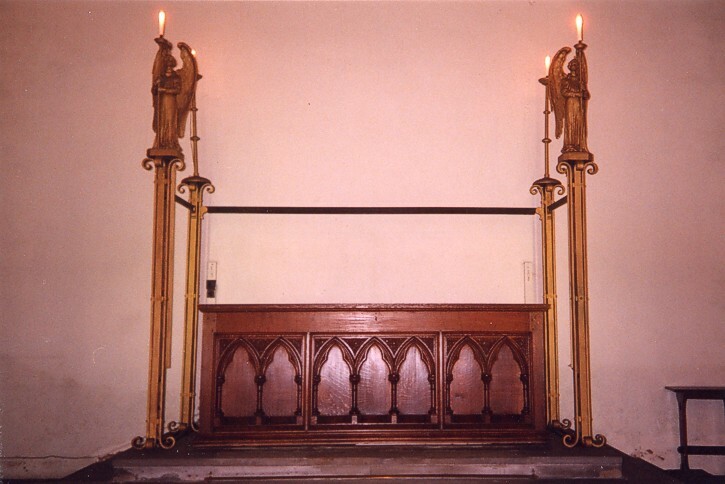 The upper part of the altar is of similar design to the choir stalls. It is of a much later date than the table, probably being about 1920-1930. Constructed of oak with a polished finish, it has three panels each with trefoil arches, and spandrels filled with carved tracery. It is completed by a plain oak cornice supported by square carving picked out in gold. 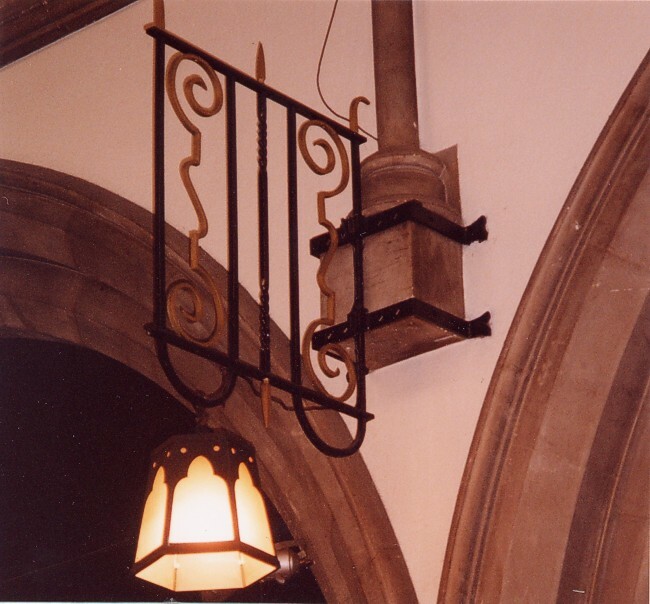 Heavy wrought iron fittings of geometric design are secured to the uncarved corbels set into the clerestory walls, directly over the pillars from which the arches rise. The iron work is painted black and gold. A single hexagonal lampshade with iron framework and glass panels hangs from each bracket. The glass panels have trefoil heads. 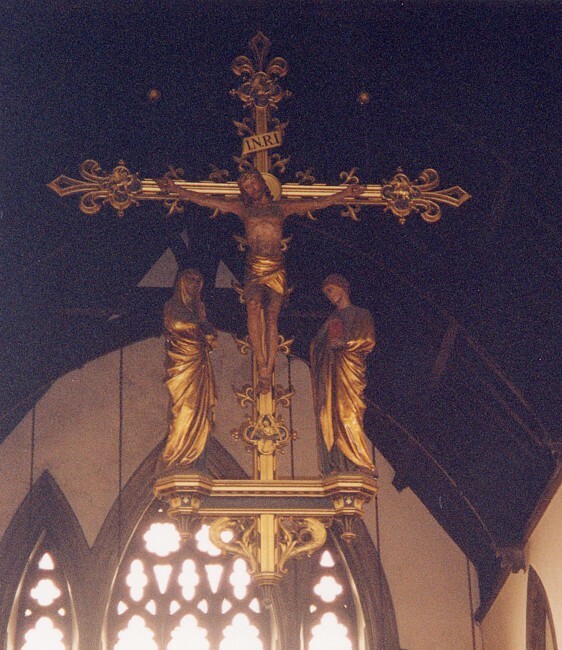 Suspended from the ceiling is a polychrome Rood cross, designed by F.E.Howard, and made by A.R.Mowbury and Sons. It was installed in 1925 in memory of John Alfred Henderson Green CBE, who died in 1919. The church had a fine lectern of considerable age. It was in the form of a brass pelican on a stout oak pedestal, the pedestal being 1.14m high and the pelican 27cm high. Painted ‘Duplex’ board leaning against wall in north west corner of church listing the Vicars, Assistant clergy and Church Wardens 1884-1944. A series of Lino-cuts in thin plain wood frames, depicting “The Stations of the Cross” possibly by Gill. 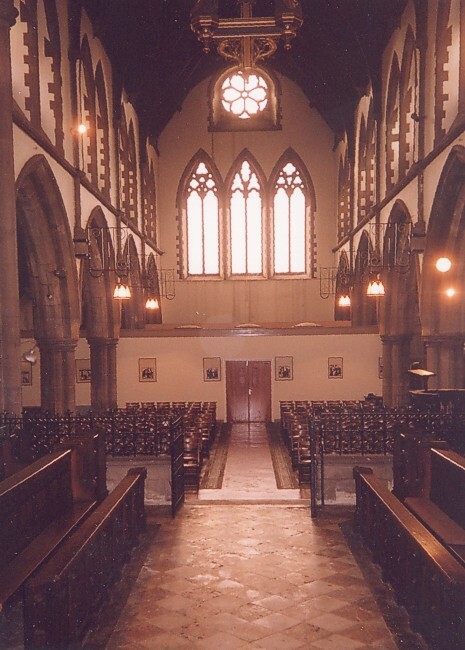 The interior of the church is set out in a traditional style, with a central aisle leading from the west door through the nave to the steps of the chancel, and aisles along both the north and south walls. An open area in front of the chancel steps links all three. A partition wall has been erected at the west end of the church, filling most of the first two bays from the south wall to the north aisle pillar. It is believed that this work was done in the 1980s. Within the divided area toilets and kitchen accommodation have been installed against the south wall. The larger part of the division is set out to serve as a chapel, with a small table serving as an altar, and about thirty chairs for use by the congregation. A pair of doors in the centre of the transverse partition allows the full length of the central aisle to be used if required. A further door is set into the side partition on the north aisle, in line with the north door of the church, which leads directly into the external porch and onto the street (St Ann’s Well Road). This area appears to be the only part of the building still in regular use until very recently. The church is built in the Gothic style, with four substantial Ancaster(?) 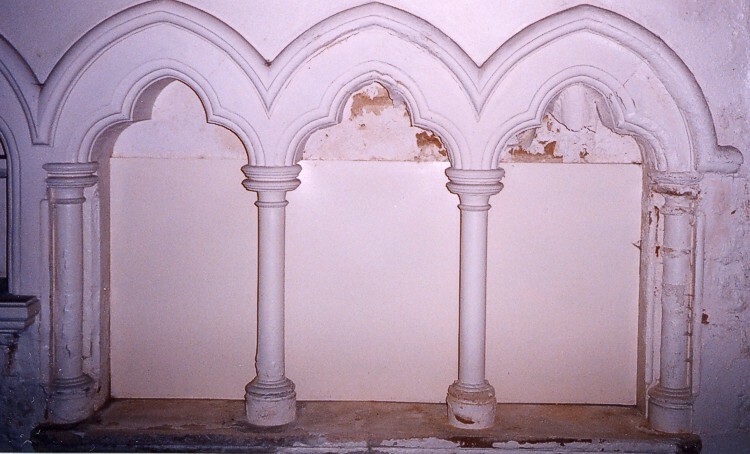 stone quatrefoil pillars, rising from moulded bases and terminated by capitals (also moulded). 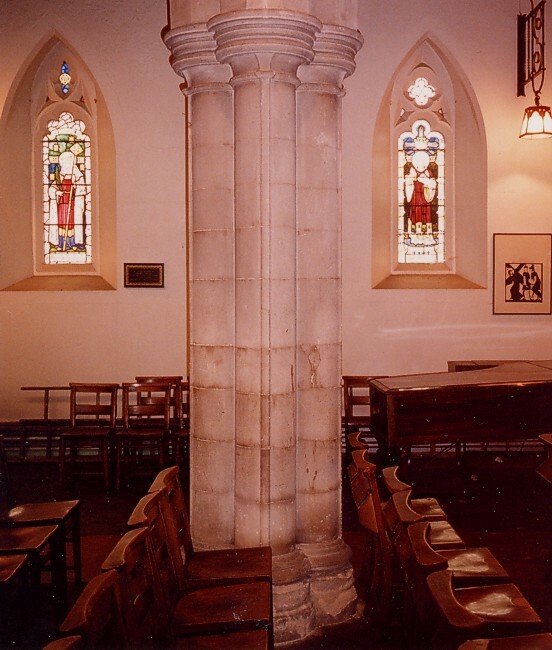 Springing from each pillar is a double chamfered arch, over which is the clerestory with four sets of double windows. Uncarved stone corbels protrude from the clerestory wall over each pillar, supporting plain shafts which rise through a stone plinth to the roofline to carry the arch braced principles of the roof. In between the shafts carved corbels at the eaves also support roof arches, which terminate at that level. 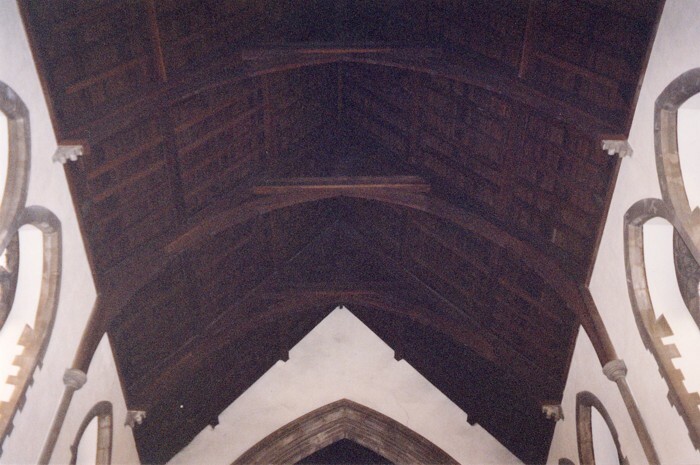 An open timber roof supported by braced arches spans the nave. The woodwork is stained to rich medium oak. The roof of the side aisles is of similar open construction, with beams rising from carved corbels set into the main walls of the church and terminating in the clerestory walls below the window level. The walls and windows of the clerestory rise from a carved stone frieze, which runs the full length of the nave over the arches. Much of the clerestory wall is given to the four pairs of double windows, the openings of which are framed by dressed stone. 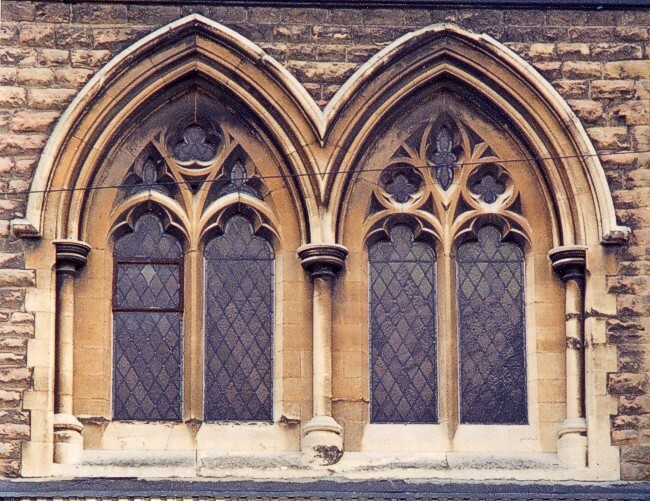 Each pair of windows is raised on a steeply sloping sill, and further divided into two glazed trefoil headed lights, surmounted by tracery. 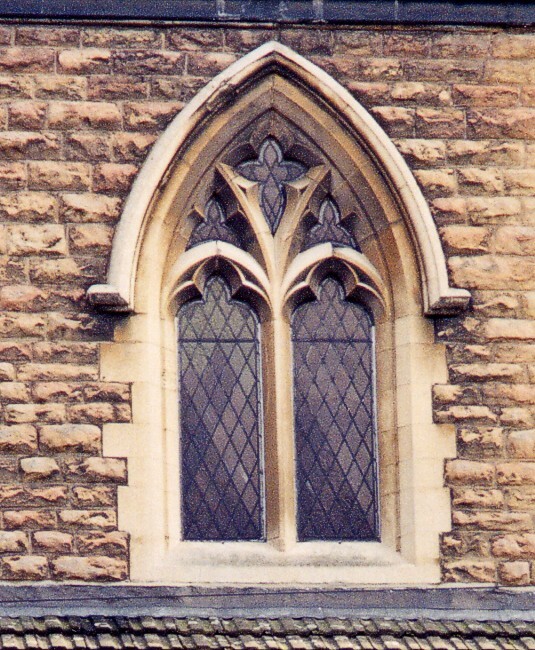 The tracery over each window is of a different design. Glazing using cathedral glass set in diamond-patterned lead completes this traditional arrangement. The level of natural light in the nave is better than in many churches. The clerestory within the chancel is very similar, but the three window openings only accommodate a single window each, they are of smaller dimensions, but still have two lights with trefoiled heads, and individual tracery designs. The reduced sizing is in keeping with the chancel roof height, which is lower than that in the nave, but again follows the same design. The entrance to the chancel is dominated by the central arch rising high above the clerestory level nearly into the very apex of the roof. 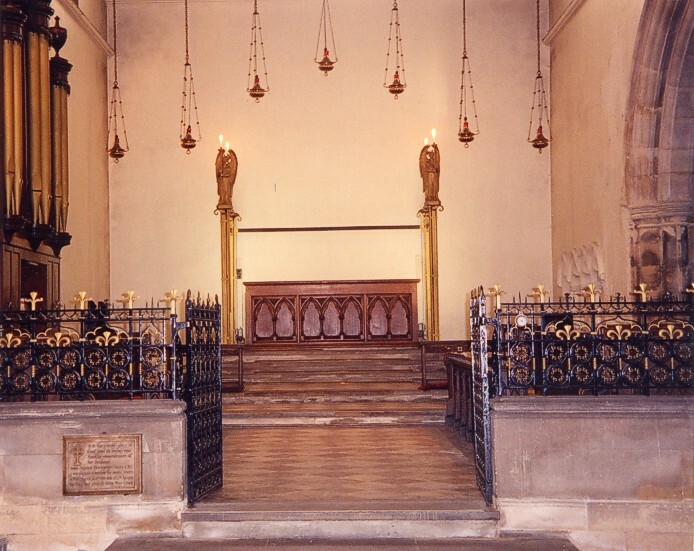 Two steps running the full width between the bases of the arch form the foundation for a low wall topped with a black and gold wrought iron screen, which separates the chancel from the nave. Access to the chancel is through a pair of gates of the same design as the screen. Two arches, similar to those in the nave, but again of smaller proportions or on either side of the chancel. Oak choir stalls with accommodation for about thirty-five choristers line each side. On the north wall the organ fills the second arch. The south wall arches are open at the rear of the choir stalls were the Lady Chapel is situated. Set high in the east wall three windows with sharply pointed heads illuminate the chancel. They are all the same height to the level of the tracery, but divided into a central three section light with a single light on each side, the central light has two additional circles over the main tracery. Shafts separate the windows. The floor of the chancel is paved with red and grey marble tiles laid in a diagonal pattern, leading to three further steps at the high altar, which is then raised on a two step platform giving it considerable height above the nave level. All the steps are of plain stone. On the south wall three sedilia below trefoiled arches, and a piscina with a round bowl and trefoiled head, complete the design. The nave floor is mainly finished with red quarry tiles in the aisles, and wood block flooring throughout the congregation seating area. Under-floor heating using large bore cast iron pipes under decorative cast iron grills set in stone troughs run along both edges of the central aisle, and at other points throughout the church. 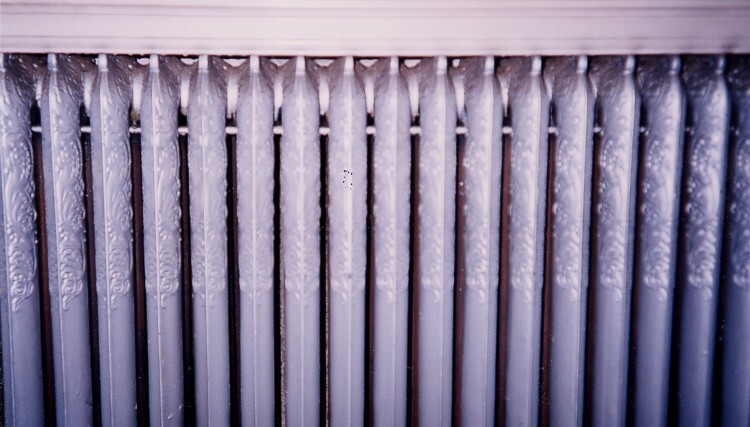 In the choir vestry a highly decorative cast iron radiator sits against the north wall. All the heat was originally supplied from a boiler located under the choir vestry, but accessed from an external door in the north wall. The Lady Chapel terminates the south aisle. 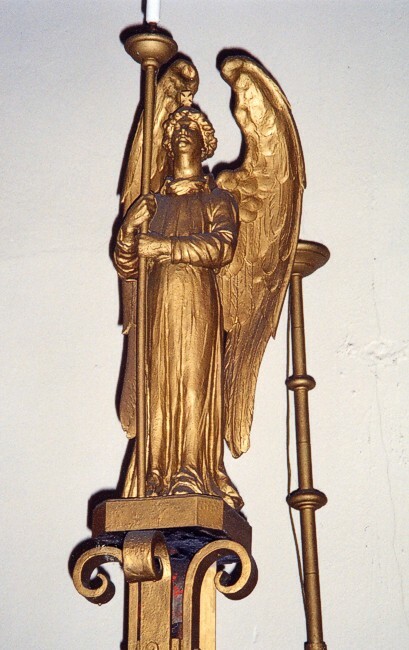 Over the altar is a double window ‘The Annunciation’ by Curtis, Ward and Hughes c.1908. It has been damaged and repaired using inappropriate materials. The altar is in two parts the lower part being the most notable. It is in fact a communion table of considerable age. Stained glass windows are set into the south wall, which forms the right-hand side of the chapel, the left side is less decorative being the rear of the choir stalls. 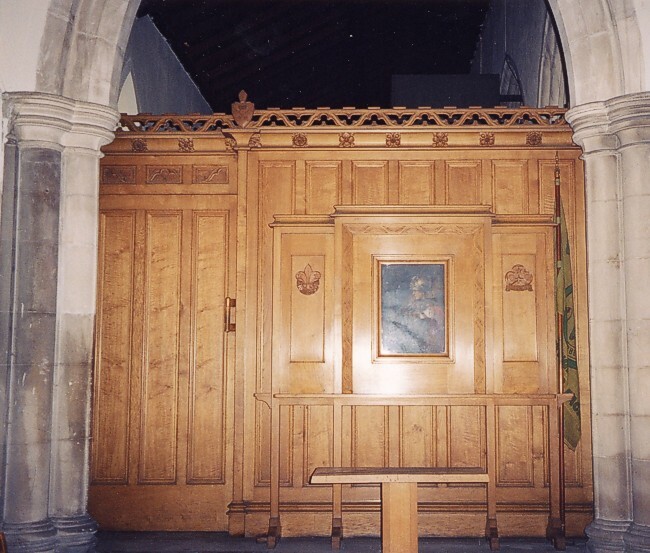 A light oak panelled screen, set in an arch with the same proportions as those in the chancel, closes the north aisle. The screen also serves as the backdrop to a chapel possible dedicated to St George. A painting of St George is the centrepiece of the panelling. On the left of the picture is the carved emblem of the Scout Movement balanced by that of the Girl Guides on the right. A fragile, faded union flag with inset insignia stands on sentinel duty close by. A door of the same panelled design forms part of the screen and leads to the vestry. The vestry in the northeast corner of the church occupies the space behind the chancel arches. Part of the first arch is occupied by the workings of the organ and appears to also have been the choir vestry. A door from this area leads to the street. The second arch area serves as the main vestry and church office. The raised floor level of the high altar gives what is probably one of the best views of the church from east to west. Despite the utilitarian division of the church restricting the full length of the aisle leading in from the west door, the towering arches on either side, topped by the deep set windows of the clerestory, creates the feeling of a building much older than St Catharine’s really is. The three large windows in the west wall are topped by a circular rose window with cathedral glass set in diamond-patterned lead. All the three lower windows share the glazing theme. They also all have sharply pointed lancets, of common height, with the lower sections divided into two, each having a trefoiled head. 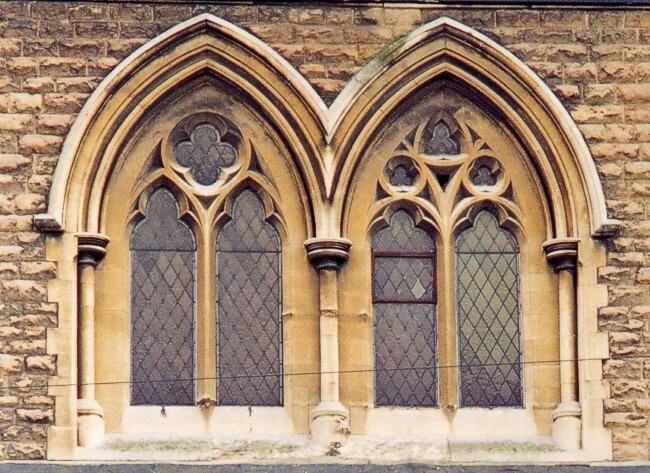 However, the tracery over each pair of windows is different. The church is aligned parallel to the main road (St Ann’s Well Road). It is set back about eight feet from the 5-foot high boundary wall, which extends along the entire length of the building. A pedestrian gateway, leading to the boiler-house and vestry, pierces the wall at the eastern end. 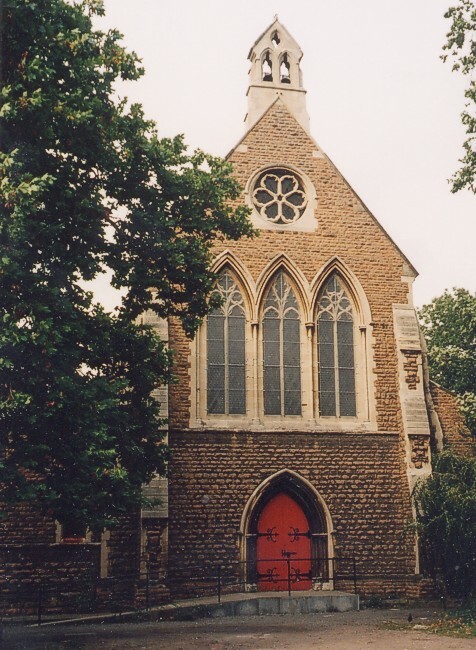 The north porch and entrance are accessed via another break in the wall, which then continues for a short distance to abut the adjoining red brick boundary wall which originally protected the old iron church. Both of the gateways have wrought iron gates, possible original features. The church has three doors. A single wooden door with decorative ironwork located at the northeast corner leads to the vestries. A porch leading directly from the pavement protects the replacement doors set into the northwest wall. The west door is the processional entrance. This door is framed by a fine moulded arch supported on two sets of shafts with bases and capitals. The wooden door, currently painted red, is decorated with iron work A concrete ramp with a hand rail gives access for the disabled - originally steps led to the entrance. Above the west door, flanked by the corner buttresses, three two-light windows of equal height occupy most of the wall. Slender shafts rise from the steeply sloping sills, terminating in round capitals, from which sharp lancets rise to uniform height. 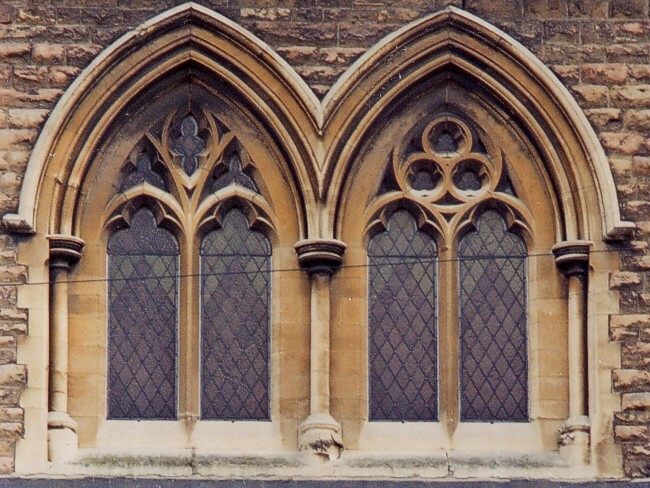 The tracery in each of the window heads is of a different design. All are glazed with diamond patterned plain cathedral glass set in lead. The highest window on the west elevation is placed centrally, high in the gable. It is a six-petal rose window set in dressed stone. The lower half of the circle sits within a squared frame, and the upper half has a semi-circular moulded surround. The glazing is as above. In contrast the east wall is much simpler, with only one window, divided into a central three light arrangement rising slightly higher than the single light on either side of it. Glazing is again as above as is the general design of the stonework. The east elevation of the church was not originally visible from the main street. It was built only a few feet from the boundary, backing onto both domestic and commercial properties. It is far less ornate than the west elevation having only one set of windows set high in the gable to illuminate the chancel within, The windows are arranged as a central three-light with a sharply pointed head, rising above the single lights which flank it. Like the west end it has buttresses at each corner. A stone cross originally rose from the apex coping-stone; this is now only a short stump. It is obvious that the church was designed to be viewed from the west end. It faces the town centre and was the most open elevation at the time the church was built. By contrast the east end backed onto houses shops and factory premises. Only since the demolition of the 1960s and 70s has the east elevation been clearly visible. The roof of the nave is slightly higher than that of the chancel. They are divided by the extended wall over the nave arch. A dressed stone coping protects the wall. Originally it was terminated at the apex of the coping with a carved cross, only part of which now remains. 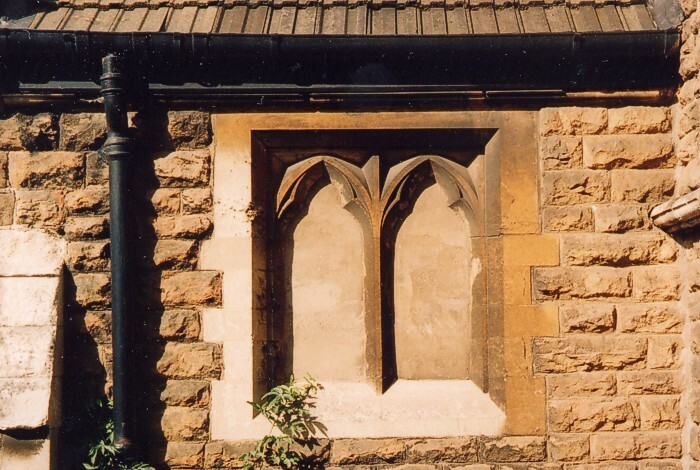 The lower east gable has the same design; here only a small stump of the cross is present. At the time of their original construction all the roofs were covered with Welsh slates. These were replaced with concrete roof tiles in the 1960s. The lower roofs terminate under the clerestory windows, running at a uniform level just below the windowsills. Much of the roof rainwater disposal system is constructed of cast iron, with deep half round gutters, at least pre-1940. In other places plastic rainwater goods have been installed.